TwistIIClean removes sand and sediment from your incoming water supply. Simply flip the red safety latch and turn the top handle clockwise for 1/4 of a turn. This will flush your filter. Flush for 10 seconds, then slowly turn the top handle to it's original position and re-set the safety latch. What size filter is right for me? Rather than pipe size, TwistIIClean filter size is chosen based on flow rate. What screen mesh size should I use? This can be due to heavy sediment load. To clear coarser sediment from the supply before filtering finer particles for your intended water use you can place a second TwistIIClean upstream of the first with a coarser screen in it to act as a pre-filter to the downstream TwistIIClean. Can I filter chemically treated water? TwistIIClean filters are not specifically designed for chemically treated water, as very harsh chemicals may adversely affect the filter components and the performance of the filter. For best results, chemical injection, if used, should be done downstream of the TwistIIClean Filter. Can I filter hot water? This product should not be placed upstream of water heaters or water over 120°F (49°C). Why is there algae in the filter bowl? Algae growth in the filter bowl is caused by exposure to sunlight. 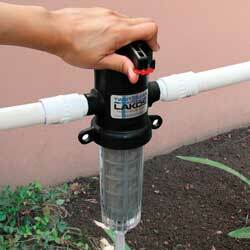 Algae growth can be reduced by installing the filter in a shaded area. Alternatively, this problem can be prevented by installing a TwistIIClean Sun Shield designed specifically for the TwistIIClean Filters. The TwistIIClean Sun Shield is a black neoprene woven cover that slips over the clear bowl to prevent growth of algae and other organics. How can I remove or clean the filter cartridge? If your filter does not clean itself thoroughly after back-washing, you may need to clean your filter element of embedded sediment. In the event that you need to remove the internal filter screen, you should shut off the water supply, remove the filter bowl (by turning counter clockwise), and finally remove the filter element. On the T2C-075 and T2C-100 this is achieved removing the holding pin at the top and pulling the element straight down. This is achieved on the T2C-150 by gently pulling on the clips holding the filter element in place until it can be pulled straight down. Pulling these clips too far may damage the filter. To reinstall, reverse the procedure, making sure the o-ring at the top of the bowl is in place.